An ancient prophecy, thousands of years old, told of the coming of the Chosen one, but she will be both loved and feared, and some will stop at nothing to defy everything she represents. A secret power that once proved too deadly, was hidden away deep beneath the sands of Egypt, only to be revealed by its sworn guardians when the time came that the knowledge would be safe. Two young archaeologists fatefully unearth unusual artifacts dating over 12,000 years old. The exhilarating find however, is wrong - very wrong. The artifacts shouldn’t be there…they shouldn’t even exist at all. 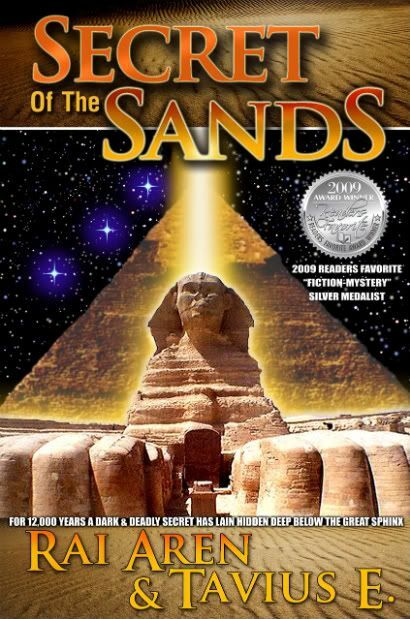 Secret of the Sands has made numerous appearances as an Amazon.com BESTSELLER in the categories of "Ancient Civilizations", "Fantasy-Historical", "Suspense", "Books, Religion & Spirituality, Fiction", "Fiction, Action & Adventure", and "Historical Fiction"! 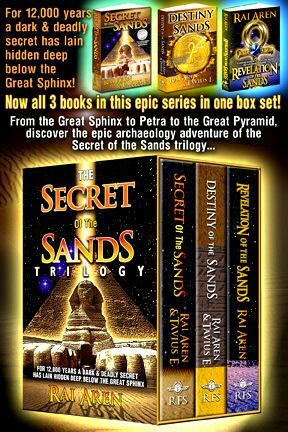 The SECRET OF THE SANDS Trilogy are Indiana Jones-style adventure novels where readers are treated to two adventures-in-one as the story weaves back & forth between a royal family with a potentially deadly secret in ancient Egypt & the adventures of a couple of modern-day archaeologists on a mission to uncover an amazing artifact that could change the world! "This is my kind of book. Please, please make a continuing series and a movie! The authors are extremely talented. I cannot praise this book enough. Fast paced, page turner, character development, fascinating plot...what more could I ask for." "Their detailed storytelling paints a picture of ancient Egypt in all its glory. The reader feels they are a part of the book, living amongst the Kierani people. The end of the novel leaves the reader curious and wanting more. 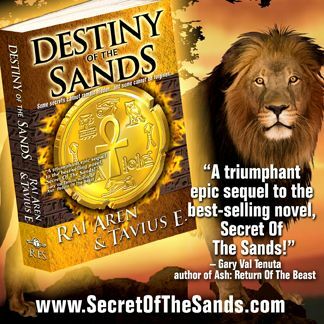 This reader can hardly wait for the sequel, Destiny of the Sands." "This is a WOW of a book! !...For those of us who are lovers of the ancient worlds, Egypt, present and past, archaeology, the metaphysical, and mystical happenings, this is a great choice for you." "This is a beautifully written book and I enjoyed reading it very much, and I would readily recommend it to anyone looking for a good story to read." "This novel is innovative, concise and enthralling. Fluctuating between present day and ancient Egypt, the pace never decelerates. The reader is treated to plausible theories regarding many riddles of this mysterious civilization. This time-honored culture is so clearly portrayed with characters which are so skillfully brought to life that one can easily imagine they are actually present as events are unfolding. The story comes to a clear conclusion yet leaves the reader desperately hoping there will be a sequel...or a trilogy...or even better yet, a whole series of these phenomenal books!" "Rai Aren & Tavius E. write a spellbinding mix of mystery, history, fantasy, and adventure in this tale of two histories - one told in the present, the other told from the past - telling a story of misused power, learning how to trust, and the fate of civilization." "A deep probing mystery riddled with prophecy and danger, Secret of the Sands uses Egypt and her mythology as a backdrop to delve into the meanings of life and religion." "Rai Aren and Tavius E. have crafted a fast-paced, exciting novel overflowing with mystery and intrigue. The tension is constant. The characters fully developed. And the plot gripping. Ancient history and present day relevance are so expertly intertwined, that you might forget you are reading a work of fiction." 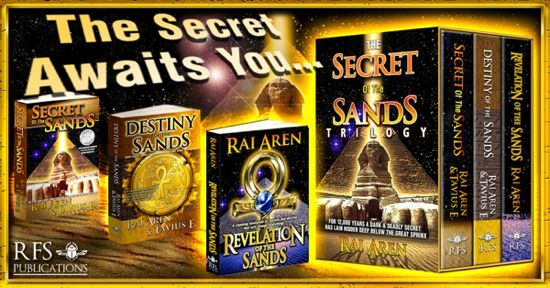 "Secret of the Sands has BLOCKBUSTER written all over it! ÉFans of what might be called the "Indiana Jones" genre of fiction will be thrilled with Secret of the Sands. Like a race horse on steroids it blasts out of the gate in the opening prologue and doesn't stop running until it reaches the finish line. 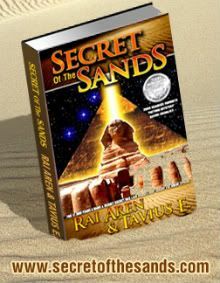 This remarkably well conceived and well executed first-time novel by Rai Aren and her co-author, Tavius E. is loaded with adventure, prophecy, mystery, secrets, deception, epic-scale battles, romance, good guys, bad guys, liars, cheaters, scoundrels, and, of course, heroes...Secret of the Sands is a thrill-ride..."
"The description that initially comes to mind is Indiana Jones, with a bit of Stargate, Mummy, and 5th Element, yet remaining completely unique. Secret of the Sands is an excitingly vivid, page-turning adventure infused with history, humor, and excitement. Rai Aren and Tavius E. have created a spectacular story with characters that I just love or simply love to hate. Like National Treasure, there is just enough historical and scientific fact mixed in to make the fictional story plausible and fun. And what a wonderful way to spotlight archaeological theories that have lost the public eye. I kept wanting to read and, by half-way through, I didn't want to put it down. Secret of the Sands was a thrill ride until the very end and I loved every minute of it!" "Secrets, deceit and lies can make almost any novel exciting. But, add to that, two stories simultaneously told then throw in some romance, science fiction and a power struggle and what do you get? A true page turner that takes you on one heck of a journey." "The pacing is flawless, the characters well-defined, the history thoroughly researched. The authors have done their homework, and I can't wait for the sequel. I would enthusiastically recommend this novel to anyone who wants a real page-turner!" "The authors take us on a wild rollercoaster ride full of secrets, romance, lust, seduction, loyalty, royalty and deception that takes place 12,000 years ago where all is not as it seems. Two modern day Indiana Jones type archaeologists discover the secret of the sands and unravel the mysteries and dangers the secret holds." 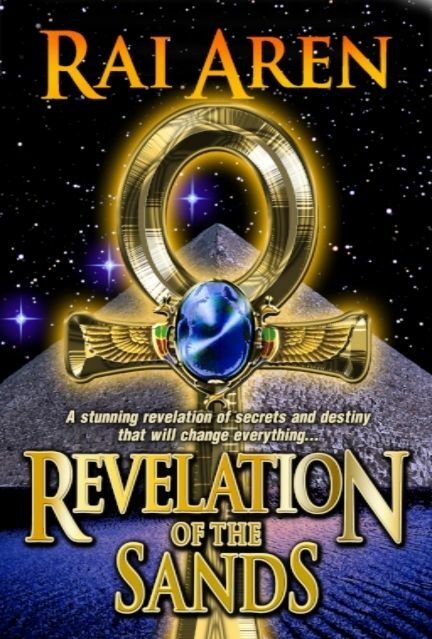 "I'd recommend this to anyone who is enchanted by ancient civilizations and the mysteries of how things might have come to be, such as why and how the Sphinx was constructed." 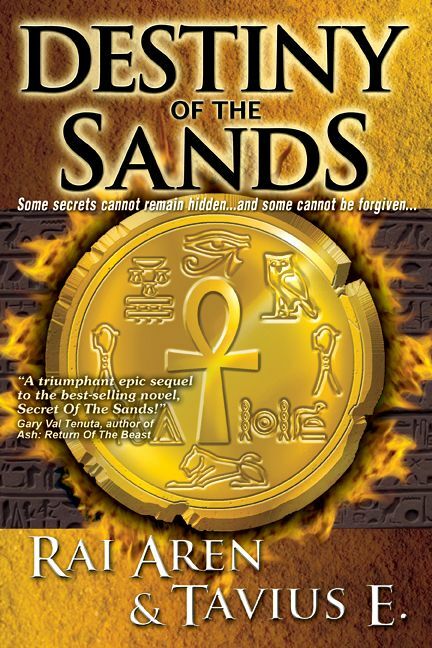 "Secret of the Sands is far from your typical archaeologist-finally-finds-ancient-archeotype scenario. It is much, much more. Definitely a book that one can say 'satisfies your thirst, yet leaves you quenching for more...'"
"While I've certainly enjoyed my share of novels, few of them have left me wanting to rush out and by the sequel as much as this one does." "Have you ever wondered how old the Sphinx really is? Have you been intrigued by the mysteries swirling like the desert sands around this awesome ancient monument? Rai Aren and Tavius E. have written a mesmerizing story in which two young archaeologists discover an artifact that could provide all of the answers. 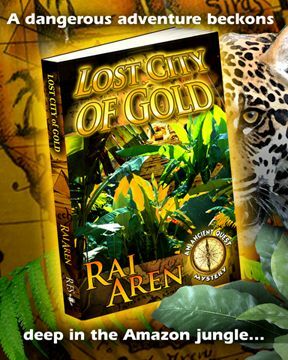 But they are not the only ones who are interested in this relic, for it holds a power unlike anything seen on Earth before...This novel is packed with adventure and suspense, and the style is fast-paced and filled with vivid description." 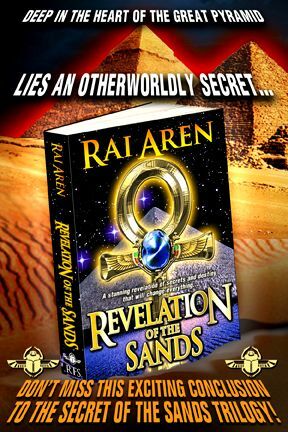 "It is my belief that Rai Aren & Tavius E. fit as Master Storytellers and Great Authors." "The authors have successfully woven a story based on archeological events mixed with their own ideas of what happened to the Sphinx and the mysteries surrounding it." "This book bounces back and forth in a fascinating balance between modern day archeologists and a theoretical civilization from 12,000 years ago...The story is told in a deft, yet casual style that makes it accessible and fun for any reader." "The mark of a truly good story is one that transcends the ages. Although the writers may base some of their novel in the past, a good yarn echoes into the present and future, as well. Secret of the Sands cherishes love, family and honor, condemns evil and treachery and presents us with a tantalizing theory of what lies beneath the great sphinx." "I recently finished this book, which I literally devoured,and was never so sorry to be finished with anything in a very long time. In all honesty, I'm not easily pleased when it comes to my favorite subject, ancient Egypt, and it takes a lot to grab and hold my attention. This book most assuredly did just that. The authors were able to seemlessly transition between ancient times and present day, never losing the momentum of the story. I particularly enjoyed the way they incorporated the possible premise that the Sphinx, not to mention the Egyptian civilization, is older than is commonly believed by the present day archeological community. I share that belief actually. I recommend this book strongly to anyone looking for a great read and I simply can't wait for the next installment. The day it's released will be the day I have it in my possession." "Secret of the Sands mixes mystery, ancient Egypt, romance, and as well as paranormal elements to make a fascinating novel."